Is there such commercial Kirby called a Janitronic? i read about i ton someones profile dream machines. Is there such Kirby named that? Yes, there certainly is,,,besides the Janitronic, there was a model called the Super Sweep, and maybe one other. They were manufactured by Scott and Fetzer (the maker of Kirby) in the mid to late 1970s,,,the motor of the machine is the same as a 500 series Kirby, but the rug nozzle is extra wide, and the handle bale and handle grip are the same as a Kirby Classic. The rug nozzles to these machines were not detachable, and no attachments were avalible, unlike any other Kirby (more like a Royal),,at least of the ones ive ever seen. Ive seen one Janitronic that was green, motor,rug nozzle, and handle bale,,the handle grip was white. Ive also seen a Super Sweep that was blue, with a red, white and blue bag,and handle bale, and white handle grip,,,im thinking this model came out in 1976, to coordinate with the Bicentenial colors of the time. These special model vacs were mostly used in industrial/commercial applications. I do know that the brush rollers that were extra long of course, are no longer avalible. Thinking about it now, i wonder if the 3d version of the Janitronic/Super Sweep type of Kirby as called a "Lincoln"? I could be wrong on that, but it kinda rings a bell. This one was found new in Kewaskum, WI. You can see the 500 Series in this one! Thats a nice looking COMVAC..Does anyone have a pic of a Janitronic? Man,id LOVE to have a ComVac! If anyone ever comes across one for sale,, please let me know! BTW, what is the bag system like on these? Does it take a Kirby disposable bag,or F&G, or? Wish i had the brass ones like that, mine are the beige plastic ones, darn it. Here's an early Janitronic but it is incomplete. It is the first issue because of it having mainly copper external housing parts... and the trim parts being the same color as the Dual Sanitronic 50. I may have to go and pull out my blue one out of my storage just to take a pic for you. The ComVac group came out when the Heariitge I cam out I know I worked at out Local Kirby store at that time. I have the wider head looks like a Classic-Tradition wide head. At the top of the handle, actually infront of the handle it is the cord hook for the big cord it had this is where the pushbutton switch is to turn it off and on. I might be misaken but all of them had a sani-emptor on them if my memory serves me correct. I know the one i have does. David, I can't recall a single Commercial Kirby that was manufactured with a Sani-Emptor. All the models I know off took the F&G disposable bag. It would make sense for somebody to convert one over to a Sani-Emptor, you never have to buy bags, and never have to clean-up an exploded F&G bag! So did Kirby only make commercial cleaners since 1967? And do they still make them? I'm not well-acquainted with Kirby but am surprised that I've never heard anything about its commercial vacs till now. Does anyone have a list of the Kirby commercials by year and color/style? @Kevin: No, the commercial market was always a niche market for Kirby. Scott Fetzer acquired American-Lincoln in 1968, when the Janitronic (and the Dual Sanitronic 50) was a year old, and so the A-L Super-Sweep (and the standard-width Sani-Sweep) resembles the Kirby cleaners of the day. 1984 was the last year of Kirby's entry in the commercial field. When Scott Fetzer sold American-Lincoln to McGraw-Edison that year, the Kirby division's two-year old COMVAC brand was also shelved. Sorry, I should have said Dual Sanitronic 80, not 50 in that last reply. I used to have a Scott & Fetzer machine called "The American Lincoln" that was like a D80 but the motor unit was painted midnight blue, with an off-white (or gray?) bag and red accent colors. It had the extra-long nozzle as shown in the copper-colored machine above, no belt lifter (just a cap) and no sani-emptor. And I've seen, but never had, a Scott & Fetzer "Super Sweep" -- same basic design but done up in dark jade green. A vacuum body made from copper? Wow. And why copper rather than aluminum? Or is that plating over another base metal? Very interesting. Defiantly plating! A solid-copper Kirby is more un-economic then exchanging all your $$$$$ for Yen, then attempting to buy a science oven in an American department store with Mega Yen. Forgive me, my Comvac then may have been switched. Mine that looks like a Heritage I. ,to lower the handle you have step on the lever before the handle will release, must have been switched I guess. Mine has the same grey sani-emptor as the Heritage I and it takes a Heritage paper bag. I will look for my brochure in my collection of ads and pamphlets. Do you have that brochure as well? Maybe that style of bag was on the smaller ComVac was the only bag that was that way and with bigger like mine they put the sani-emptor on the one like mine. who knows. To me that seems kind of odd, why would Kirby sell you something and then have you buy some other brand bags rather than their own. I could see the F&G style orange bag being an after market product. But it could be my memory, it is not as good as it used to be. I also saw the smaller Comvac once but do not remember that specific of detail. There's nothing to forgive, David! I unfortunately do not have a paper copy of the ComVac pamphlet! Lucky you! 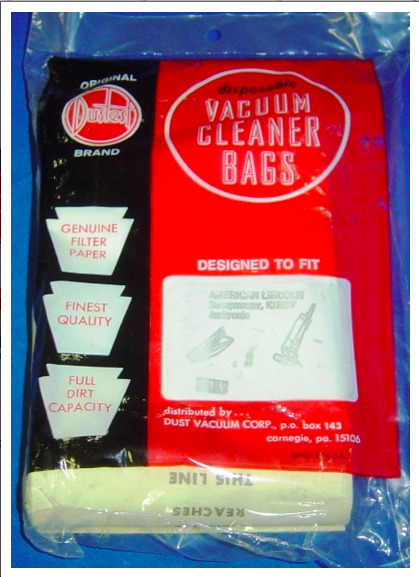 My Comvac 1600 does not have an emptor.The bag fill tube connects right to the fancase discharge.The bag can be used as a dump bag or use paper ones. I would like to think the COMVAC's failure to put a dent in the commercial market was because one model had the older architecture (the 13" wide CV1300) and the other had newer architecture (the 16" wide CV1600), despite certain parts being shared across both vacs. It can be confusing somewhat if one company bought both models. David it's nothing but incorrect information, you don't need to send flowers and an apology card! EVERYBODY gets something wrong once in a while,I know I've had my share of realizing I was wrong about information I had given. But now both you and I know better, and we can educate vacuumland with our now-correct information! Where's the nuns with the rulers... 50 across the knuckles & no lunch!! No Mark, you must be confused! That's for the Kirby torturers in room 409! Lol @ nun tipping I once put down for hobbies & also eating. I discovered a package of bags designed to fit American-Lincoln Sweepmasters and Kirby Janitronics @ vacpartsplusstore.com/catalog/in.... I would presume that the bags would also fit the later Super Sweeps, SuperVACs, and ComVACs. I'm curious to know if a Sweepmaster was similar in style and design to the Janitronic?